So I wanted to try and make a "useless" combat character and see how well it would do in combat. But what I found out was that my main has a lot more health than she should have. I don't know if im bad at calculating it but it seems to be very wrong. Haven't done other calculations but will trie to look at it later today. Hope this is the right place to post it. The only exception is the ranger that skips adding extra health between lvl 2 and 3 (so they end on a total of 102). I have experimented with a con of 10 (+20%) and the first two levels seems to fit with each of the classes health/stamina stats, but then starts to increases in size at lvl 3. 2. pick race and class. 3. 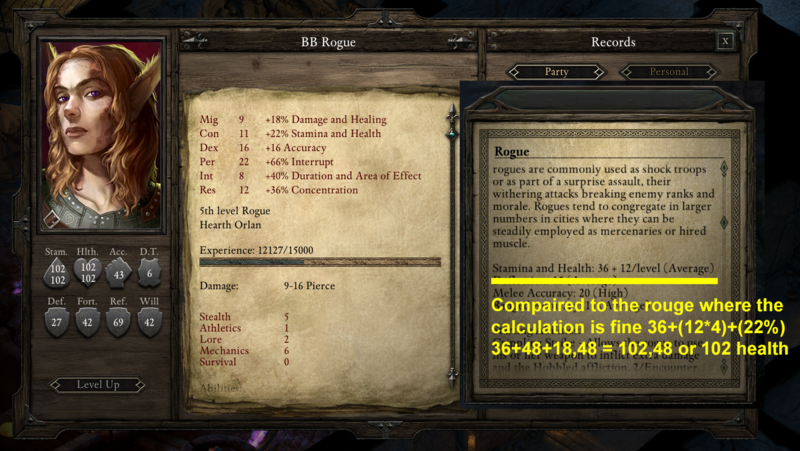 Note the classes health/stamina base (low/average/high). 3. See if starting stamina/health is consistent with base + con. 5. Level up and at each level note down stamina/health. 6. See if it matches the base for the class. 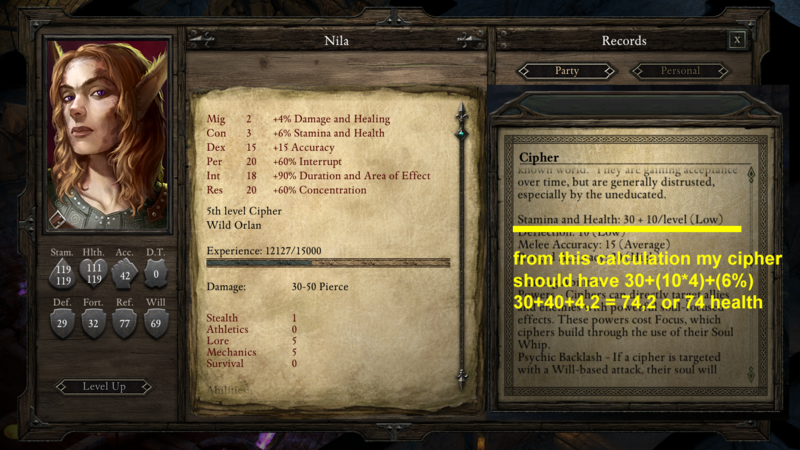 That stamina and health would follow each class and its base description. Huge impact on testing classes and their balancing if you can just dump con completely. Nice catch and thank you very much for your posting. I will look further into this issue and make sure that it reaches the programmers. I hope you continue to enjoy the backer beta and thank you for your support!